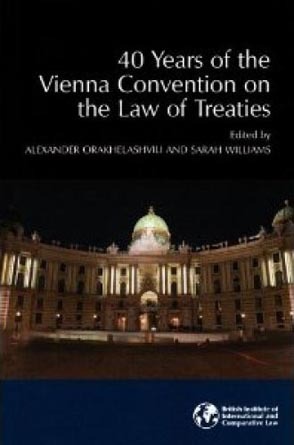 This volume presents the reader with insights as to how law of treaties has worked over past 40 years, since the 1969 Vienna Convention was adopted as the comprehensive treaty to regulate the law of international agreements. Treaties form a basis for a daily conduct of international relations and thus it is vital to see how they are made, amended, interpreted and enforced. This volume capitalizes on 40 years of international experience, described and analytically examined by a group of experts on the subject. Multiple issues the Convention covers include the aspects of conclusion, interpretation, reservations, amendment and modification, validity and other issues relating to treaties are covered. Based on the BIICL 50th Anniversary event held in London (40th Anniversary of the Vienna Convention on the Law of Treaties). Contributors: Alan Boyle, Malgosia Fitzmaurice, Mary Footer, Anthony Aust, Richard Gardiner, Jan Klabbers, Paul Eden, Alexander Orakelashvili, and with a preface by Sir Franklin Berman. "40 Years of the Vienna Convention on the Law of Treaties"